Edmontonians are open and courageous, inventive and cooperative, and we’ve seen that firsthand since we opened our doors on June 22, 1983. 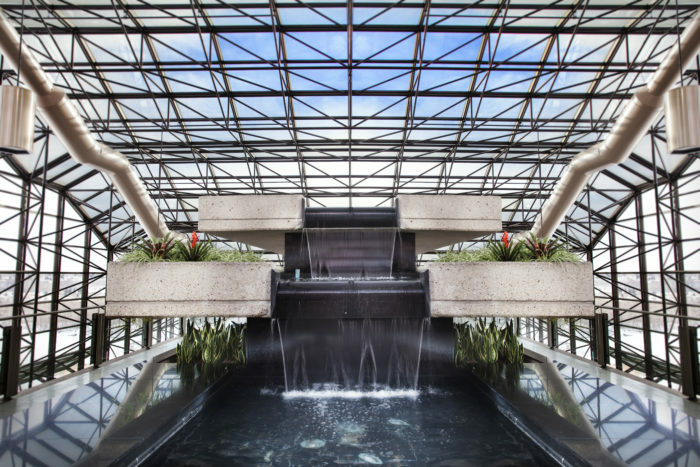 For the past 35 years, thousands of event planners have chosen Edmonton’s downtown convention centre as the destination to host their event, and millions of local, national and international guests have traveled through our beautiful atrium. 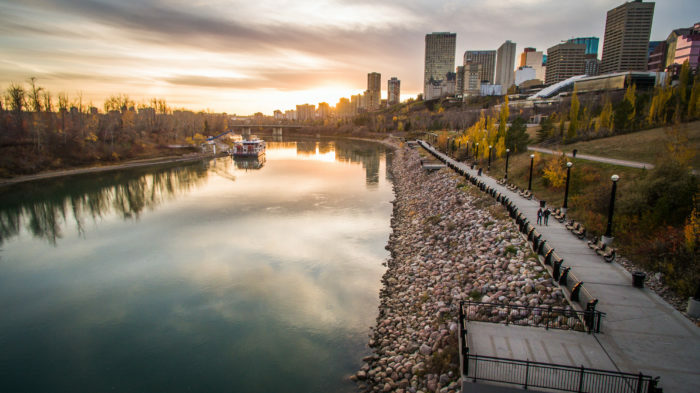 From former world leaders and royalty to artists, athletes, scientists and astronauts, we’ve been proud to bring the world to Edmonton and be a gathering place for you. 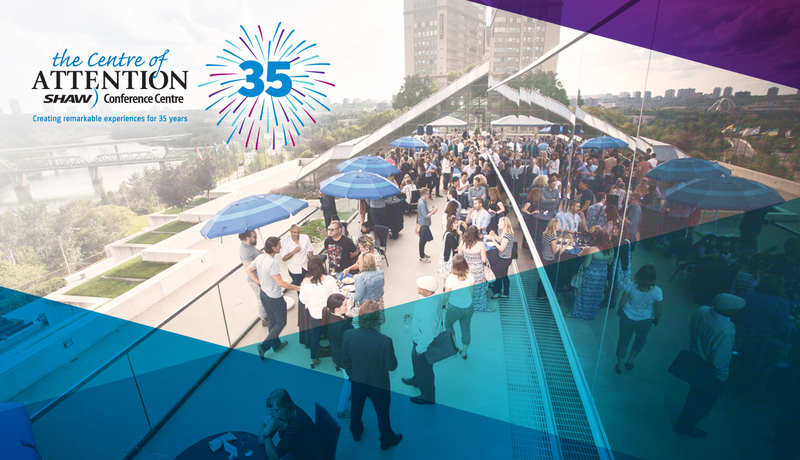 As Canada’s youngest, fastest growing city, the next 35 years are going to be just as exciting, and we look forward to continuing to be the premier destination for meeting and convention planners, and local community events. 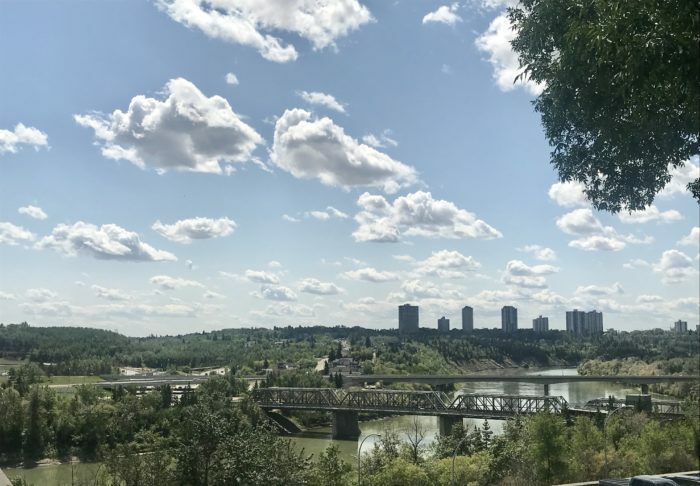 Celebrate with us on June 22nd as we host a free, community celebration on our beautiful patios overlooking Edmonton’s River Valley. For full details, visit the event page. Until the big day, we’re sharing our history by announcing one tid-bit every day for the next 35 days! Join us as we reminisce, and chime in with your favourite memories! Check-in here daily for the latest updates as we take a look back in time! Fact 1: Our official ground breaking took place on February 22, 1980 when the first shovel hit the dirt! 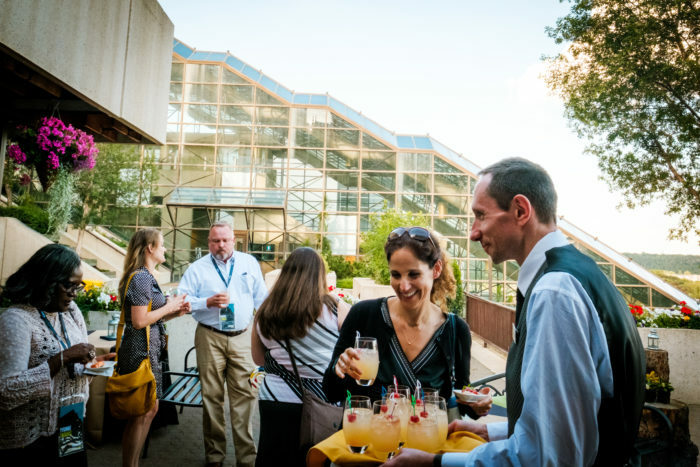 Today, we call it home to nearly 650 events each year! Some Edmontonians have grown up with us, beginning with attending Festival of Trees as children, and then their graduations, weddings, professional events and more. Some have come back with their children and grandchildren! 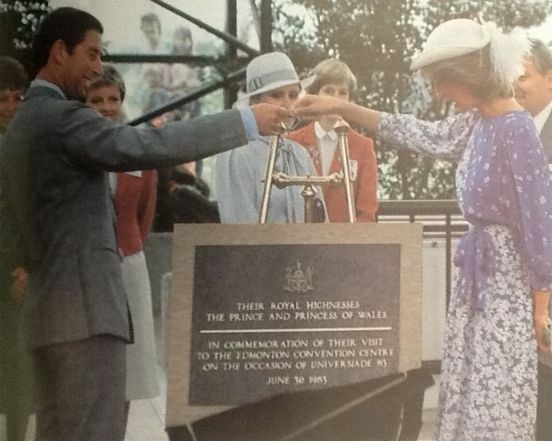 Fact 2: On June 30, 1983 Prince Charles and the late Princess Diana visited Edmonton’s downtown convention centre! Princess Dianna would celebrate her 22nd birthday in Edmonton the next day. 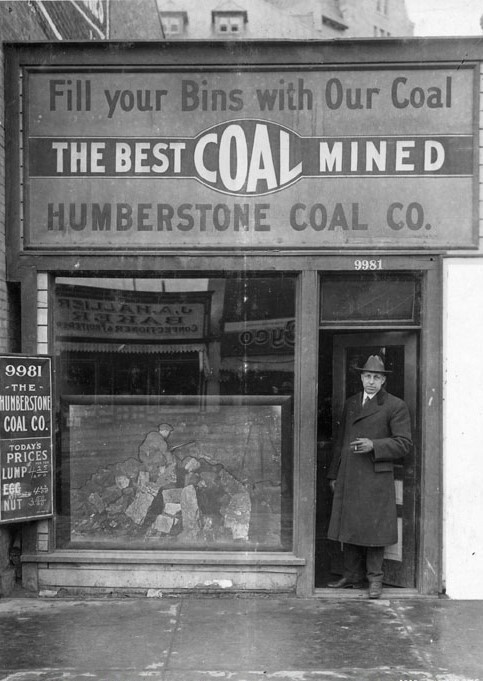 The plaque, pictured below, still sits next to our fountain at the Jasper Avenue entrance. One day we hope to have the Duke and Duchess of Cambridge, William and Kate, and the Duke and Duchess of Sussex, Harry and Meghan,visit us! Fact 3: On May 29, 1983, a ribbon was cut for our “unofficial” opening to host our first event, Medic Canada ’83, a three-day international medical conference. 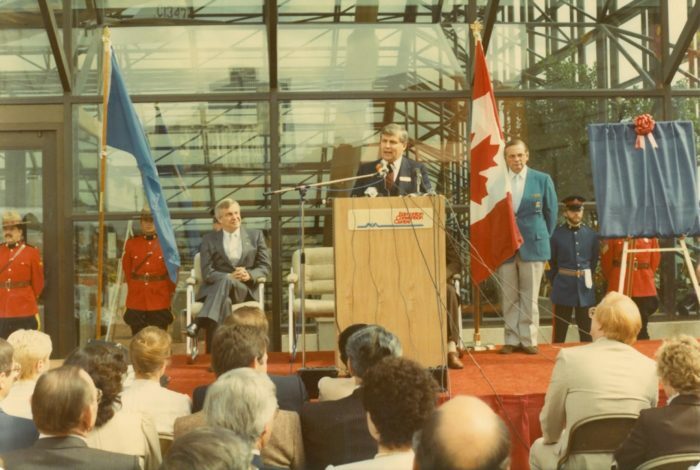 The official opening happened on June 22, 1983 with Mayor Purves and Premier Lougheed. 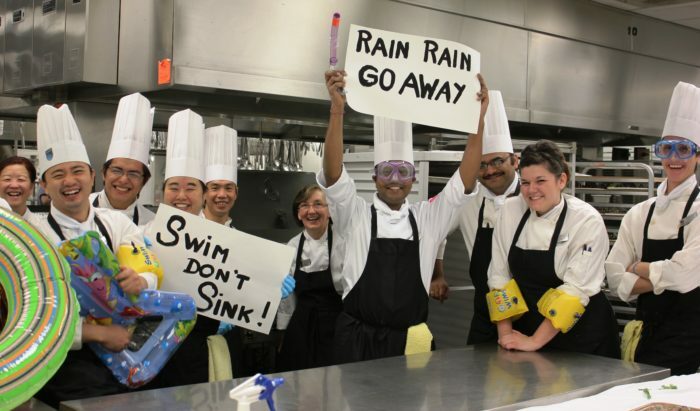 Fact 4: Our culinary and service teams are accustomed to accommodating thousands of guests at a time! During a dinner, a server may walk 36 km while carrying 35 lbs of food per course, totaling 1,800 lbs per function! In a month, we can use 600 lbs of chocolate, 6,000 eggs and 400 litres of cream. 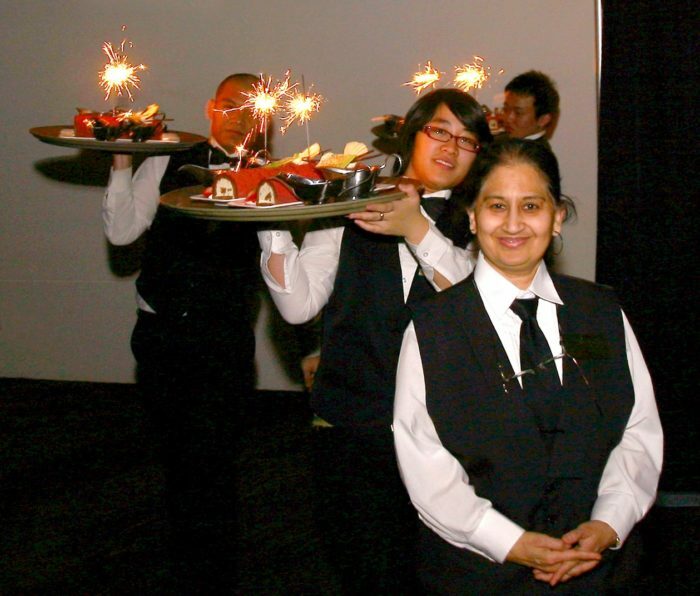 Our award-winning team can serve 6,000 guests in a night! Fact 5: We’re literally entrenched into downtown’s core! 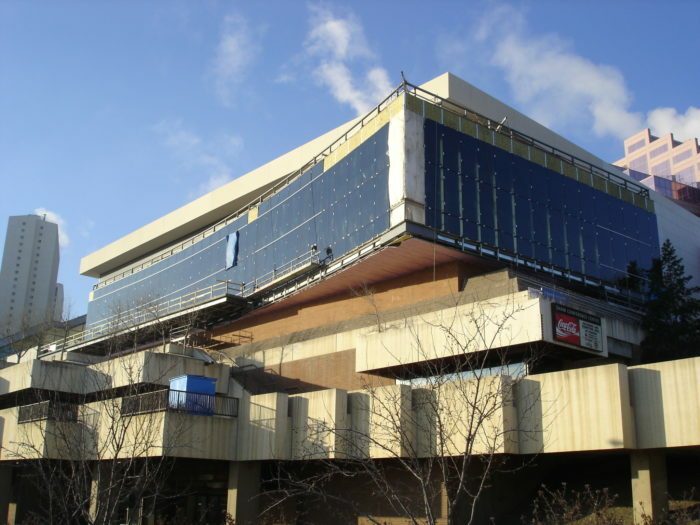 Jasper Avenue was dug up and re-built over top of our facility – our roof supports the roadway! One of our most unique features is that 70% of the building (300,000 square-feet) is located underground. From ground level to the top of the atrium, our cascading building measures over 10 storeys high! 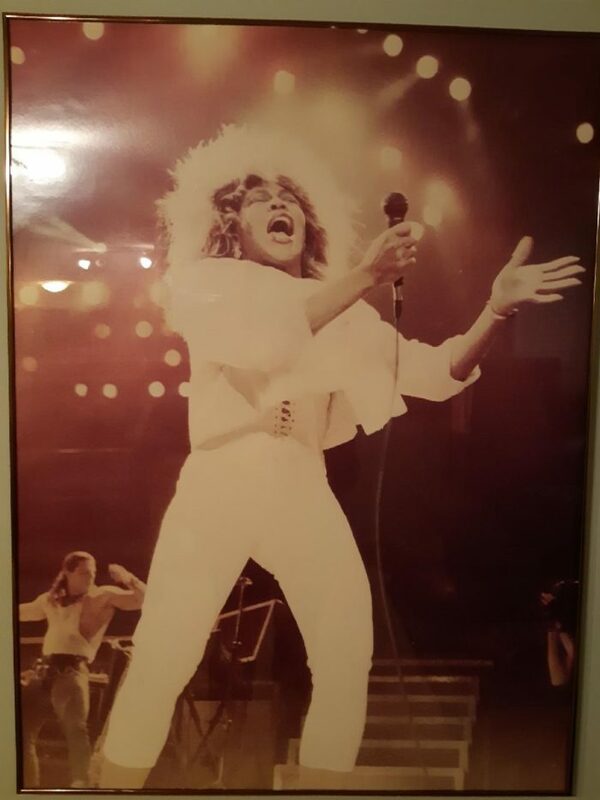 Fact 6: In 1983 we hosted our first concert with Tina Turner! Since then, our VIP performers include Guns ‘n Roses, Tragically Hip, Meatloaf, Pearl Jam, Megadeath, Backstreet Boys, Marilyn Manson, ‘N Sync, Motley Crew, Imagine Dragons and many more! Soundgarden filmed their “My Wave” music video in our halls during their 1994 concert and Metallica played their first Edmonton concert with us in 1987! What’s your favourite concert with us?! Fact 7: Our building was designed to meet the needs of cultural facility by architect B. James Wensley beginning in 1974. He was awarded the Alberta Association of Architects Citation in 1983 for his work on the facility. For 35 years we’ve provided guests with a one-of-a-kind experience in the heart of nature. A visit to our facility includes a 270-degree view over North America’s largest urban parkland! Fact 8: In 2008, we partnered with Homeward Trust to host Homeless Connect bi-annually. We’ve been thrilled to see our city come together to provide essential services to those that are in need! This is how we care for one another. It’s the Edmonton thing to do. In 2011, we were awarded the Partnership for Success ROOPH Award by Homeward Trust for our participation. Fact 9: We’re extremely energy efficient! Only our south side is exposed to the outside. 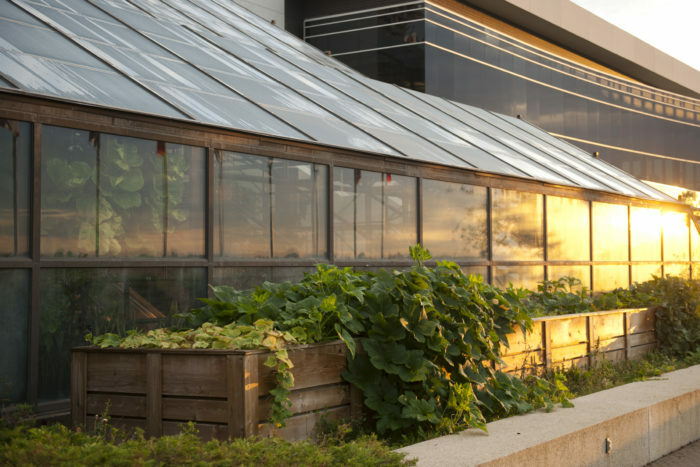 With such a large portion of the facility encased by soil, it provides an insulation effect, reducing heat loss in winter and heat gain in the summer. Our reflective roof in Hall D also helps to keep the heat away! 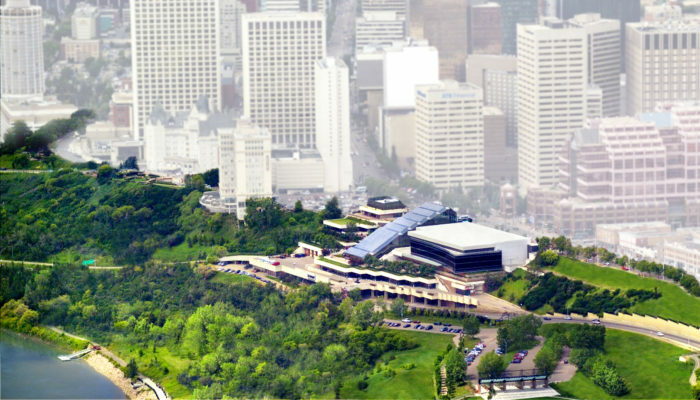 Fact 10: In 1974, Grierson Hill was recommended for Edmonton’s first convention centre for its good transportation links, hotel proximity, available land and aesthetic appeal. 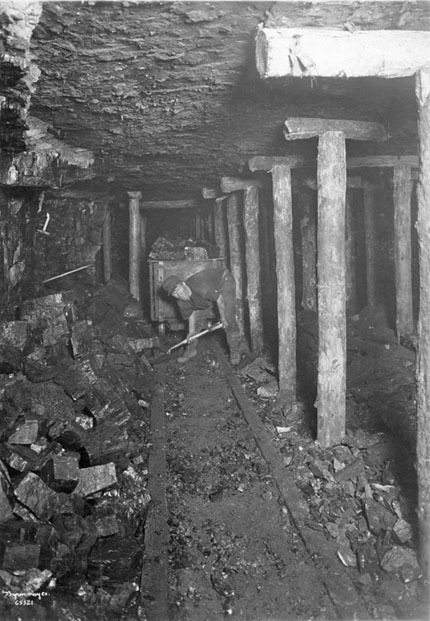 Until 1906, Grierson Hill area was home to 10 coal mines – the largest was Humberstone’s Mine, located 160 metres east of where we are today! Fact 11: In 1984, we were awarded “Facility of the Year” and “Venue of the Year” in 1998! Fact 12: We rose above the waters! 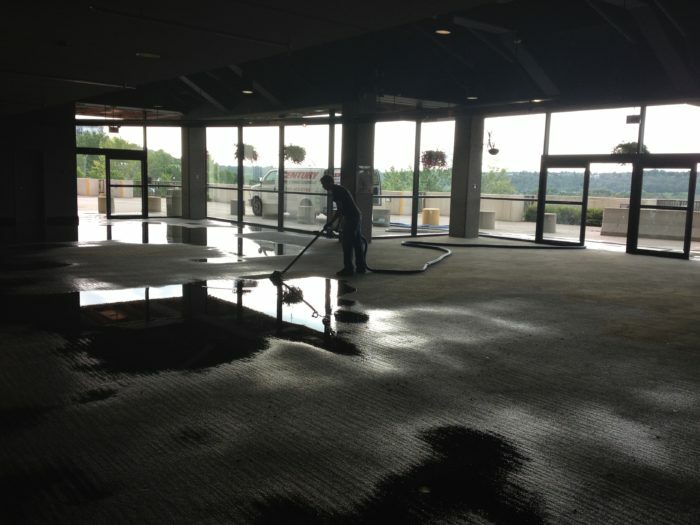 In 2012, half of our facility was rebuilt in less than 10 weeks after rainstorm damaged cause by “The Great Flood.” As a result, we learned about drying and used a few fans to host over 1,200 delegates 10 weeks later, including former Premier Allison Redford, Alberta MLAs and federal MPs! Fact 13: We welcomed our 5 millionth visitor in 1996 and our 10 millionth visitor in 2008! We are proud to be a part of the fabric that makes Edmonton an interwoven community! 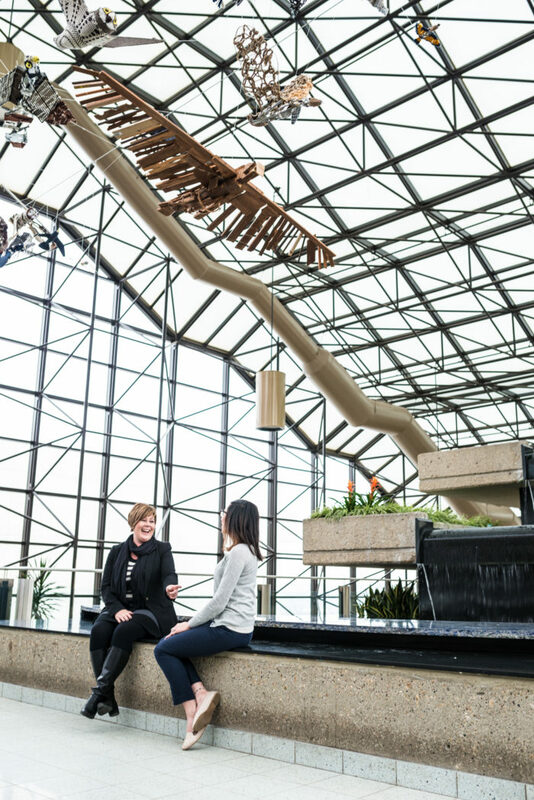 For the past 35 years, thousands of event planners have chosen Edmonton’s downtown convention centre as the destination to host their event, and millions of local, national and international guests have traveled through our beautiful atrium. Fact 14: We’re inspired by the people we work with, the people we serve, and the people in our community! In 2008 we were recognized with the “Human Rights Award for Excellence” by the John Humphrey Centre for Peace and Human Rights and in 2010, we received the Recycling Council of Alberta Corporate Leadership Award in recognition of our environmental initiatives. Fact 15: Combined, our 3 Exhibition Halls are larger than a Canadian Football League football field, and could accommodate a Boeing 727 aircraft! They are uniquely built with no support columns anywhere in the 82,000 square-foot room. Which is your favourite room in our venue? 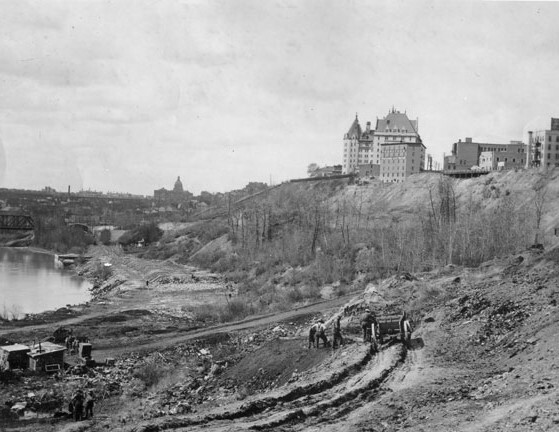 Fact 16: Building the facility below Jasper Avenue reduced foundation problems, minimized intrusion into the River Valley and reduced the area exposed to the natural elements, resulting in energy conservation! 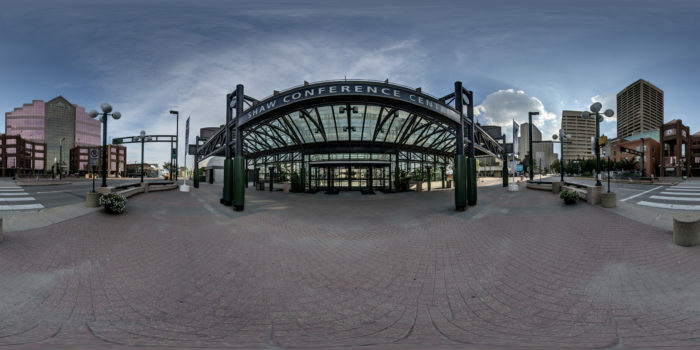 Fact 17: In 1998 The Riverview Room opened, adding 3,800 square-feet of intimate space to the facility and in 2006, Hall D opened, adding an additional 26,000sq square-feet of meeting space to attract major international events to Alberta. 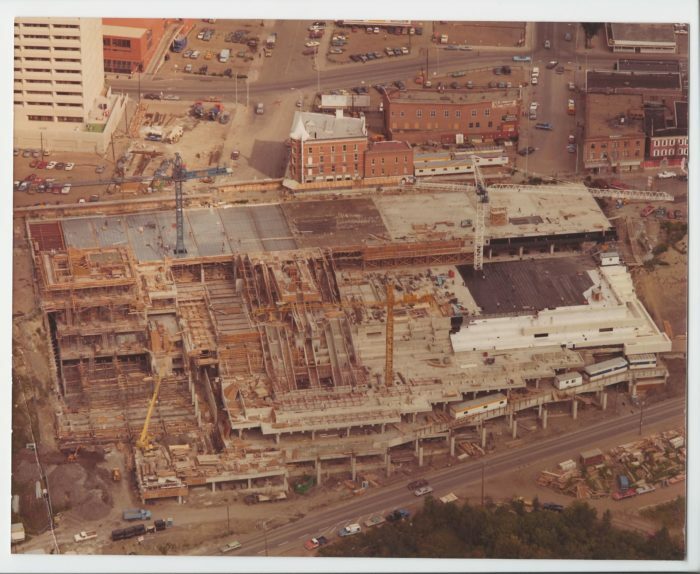 The expansion of Hall D in the Edmonton Convention Centre placed us among the four largest convention centres in the country at the time! 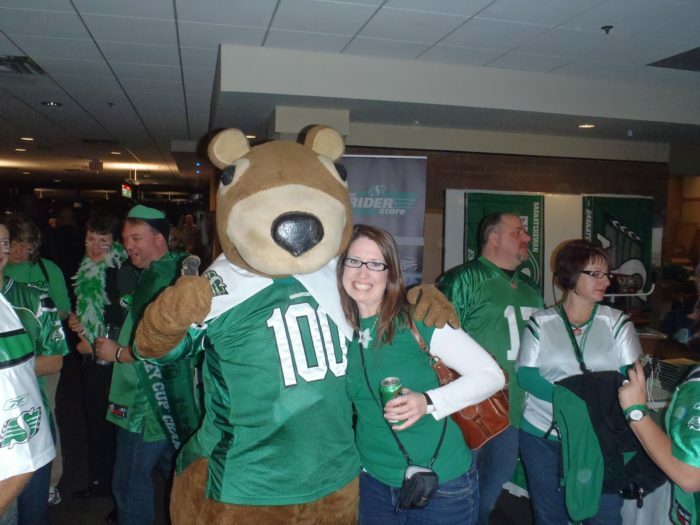 Fact 18: In 2010, we hosted the 98th Grey Cup Festival and in November, we will host the 106th Grey Cup Festival! Who’s ready to Bring The Heat?! 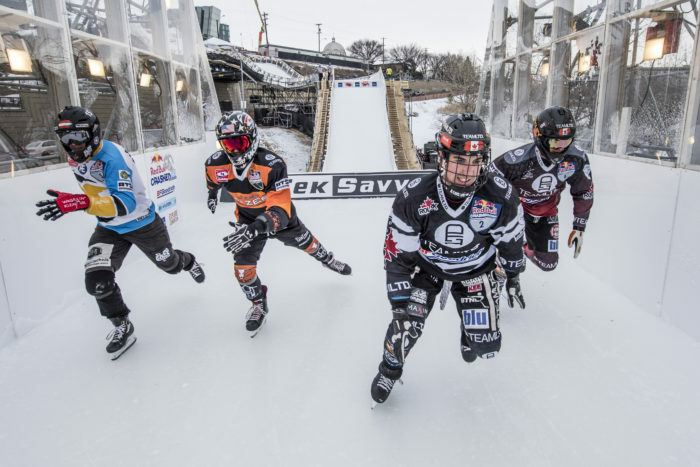 Fact 19: Our backyard was home to both the 2015 and 2018 Red Bull Crashed Ice, with a combined total of nearly 100,000 guests descending into Edmonton’s River Valley! Fact 20: We’re proud to have had some of the world’s finest chefs work in our kitchen over the past 35 years! In 1988 the renowned Executive Chef Simon Smotkowicz was hired. He led our kitchen for 27 years, hiring and mentoring many young chefs who have gone on to fantastic careers. Some of these chefs include Clayton Folkers, James Holehouse, Corbin Tomasezki, Peter Boos, Rolf Knecht, Arthur Chen, Nigel Webber, and our very own, Serge Belair. Our current world-class team features 30 chefs, including 11 Red Seal chefs who are committed to pushing the limits in the creation of remarkable dining experiences. Hear more from Chef Serge. 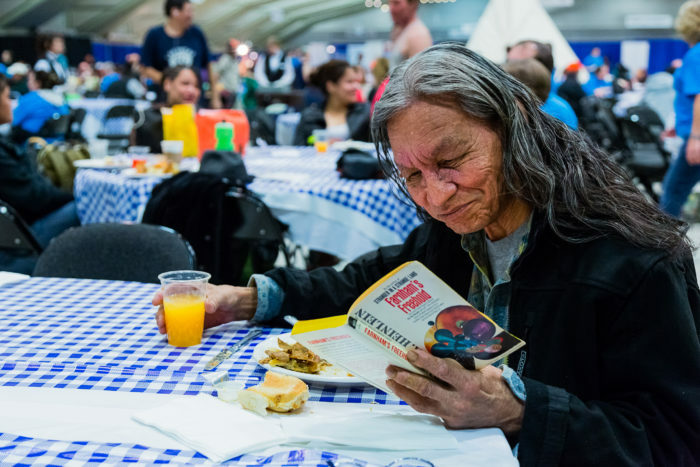 Fact 21: Each year, we prepare 250,000 meals, donating leftover meals to the Edmonton Food Bank for those in need. In 2009, we became the first organization in Edmonton to sign-up for the Edmonton Food Bank’s Second Helping Program. Since then, we’ve donated nearly 6,600 lbs of food to those in need each year. Fact 22: We source 60 % of our food from local community growers to support the local economy! We care for your food with integrity and artistry. Our award-winning team with 11 Red Seal chefs deliver an authentic farm to table experience. With every dish crafted in-house, our team of 30 chefs can customize any meal to your heart… or stomach’s content. 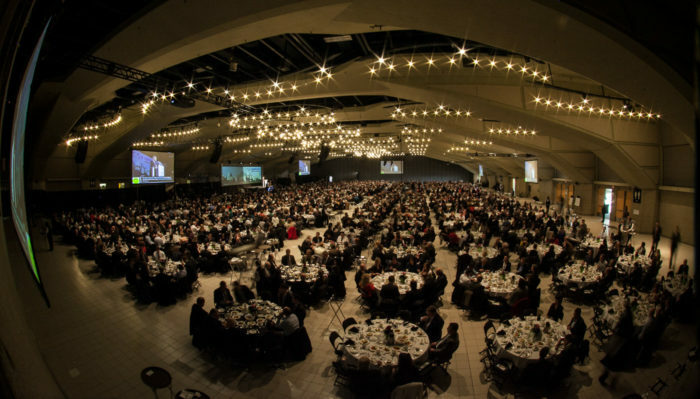 Whether it’s dinner for 5 or 5,000, the culinary experience at the Edmonton Convention Centre reflects our commitment to quality and innovation! Fact 23: We’ve welcomed many famous individuals through our atrium over 35 years! In 1998 we hosted the Universal Rights & Human Values Reception & Banquet attended by Archbishop Desmond Tutu. At the end of service, he thanked our current Director of Guest Services, Amber, for the fantastic service and gave her a blessing! Listen to more from Amber! Fact 24: In 2016, we installed an Urban Beehive on our property that produces up to 90 lbs of honey for our kitchen each year! The busy bees pollinate our sustainable permaculture surrounding our venue, and they attracted the attention of the Japanese TV show Bee World! Fact 25: Since 2008, we’ve participated in the High School Culinary Challenge to engage local students who wish to embark on careers in the culinary arts. Students learn from the best in the industry and are awarded scholarships to continue their passion for cooking! Many chefs have begun their incredible careers beginning with this program! We were fortunate to have Meuwley’s co-founder Peter Keith begin his career with our team. Hear more from Peter about his culinary training experience! 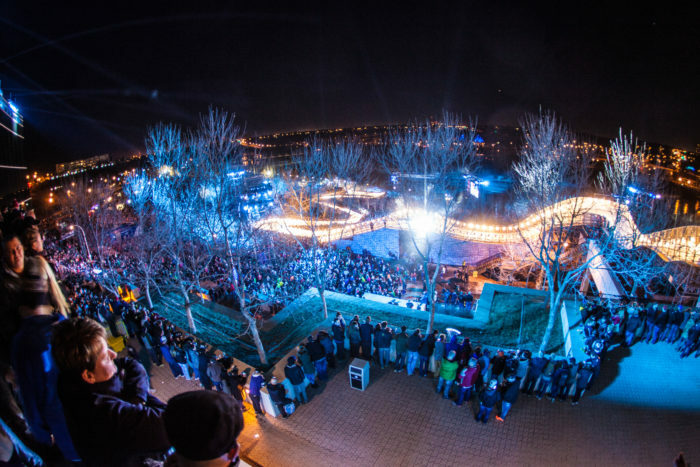 Fact 26: We proudly house the stories of Edmontonians as a cultural hub! 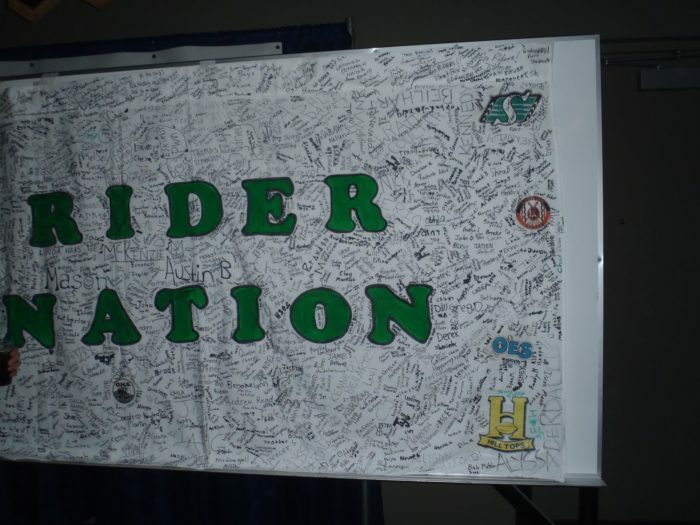 In 2010, we collaborated with two Edmonton School districts to found our pARTnership Gallery! Over 450 students from Edmonton Catholic and Edmonton Public Schools have had their work featured on our walls. Students take pride in contributing to their community and finding a passion for the arts! The pieces we house reflect Edmonton’s vibrant spirit, and we hope you see yourself in the work displayed. 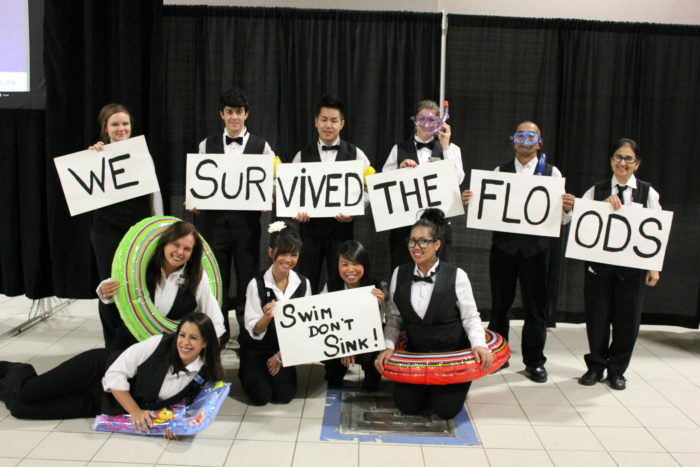 Fact 27: In 2016, during the Fort McMurray evacuations, our team helped move a massive event from Edmonton Expo Centre to our facility with just 24-hour notice. Our team pulled together to have the doors opened and plates ready to go for guests at 5:00pm the next day for the Junior Achievement Awards! 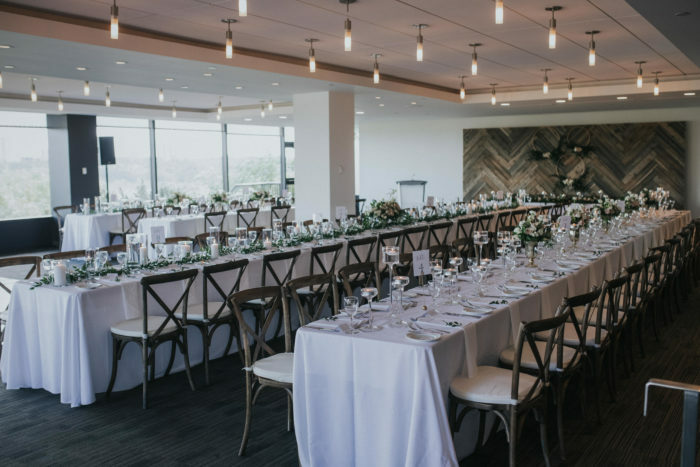 Hear more from CEO Events planner Anne Finzer! Fact 28: Marilyn Manson was booked to perform at the Edmonton Convention Centre a few years ago and sent a long-list of eyebrow-raising, pre-show requirements! One of the most eccentric items: a dressing room as cold as a meat locker and black, from floor-to-ceiling. 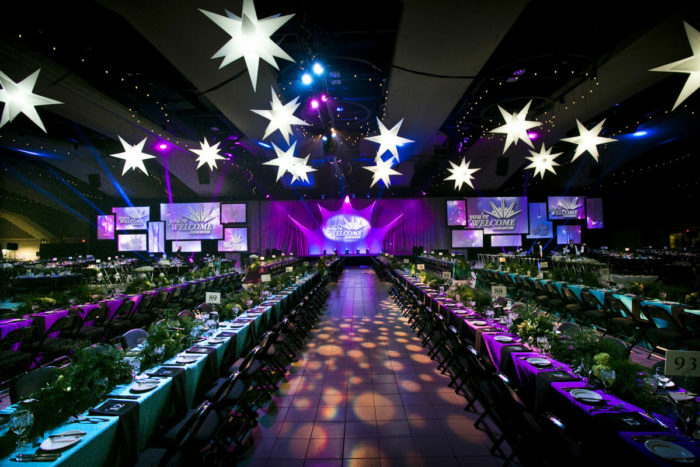 Edmonton Convention Centre staff bent over backwards to ensure the walls, furniture, and decor were black in colour and the room temperature a perfect 16 degrees Celsius. Hear more from concert promoter Kevin Radomski! 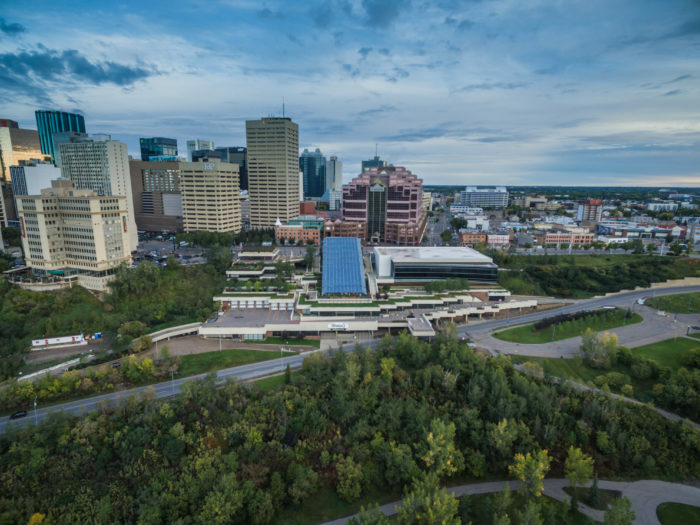 Fact 29: In 1993, we proudly became a part of the Edmonton Economic Development family along with business development, tourism and advanced technology and education. 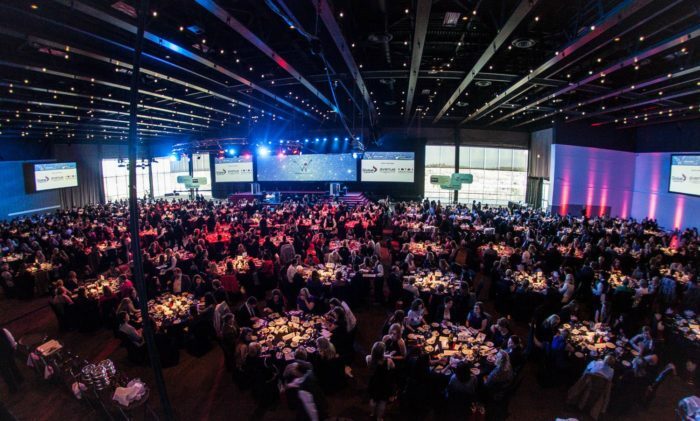 Since then, the organization has adapted to best meet the needs of Edmonton and is now composed of 6 divisions; Enterprise Edmonton, Innovate Edmonton, Edmonton Tourism, Edmonton Expo Centre, Edmonton Convention Centre and Corporate Services. Together, we cultivate the energy, innovation and investment needed to build a prosperous and resilient Edmonton economy. Fact 30: The word Monto can be found within the centre of our city’s name, Edmonton. This special Cree word means the divine essence, or power of the Creator. 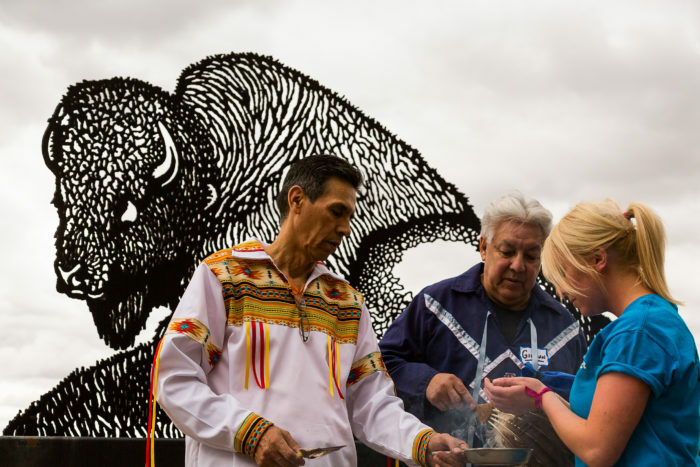 We are proud to be located on Treaty 6 land, where ancient people gathered to celebrate and trade. Like Monto, we are found in the centre of our city as a modern day gathering place to continue tradition. Fact 31: The family of J.R. Shaw donated our bison sculpture, Paskwamostos, to us in February 1999. It was created by Joe Fafard, representing strength, food, clothing and shelter. 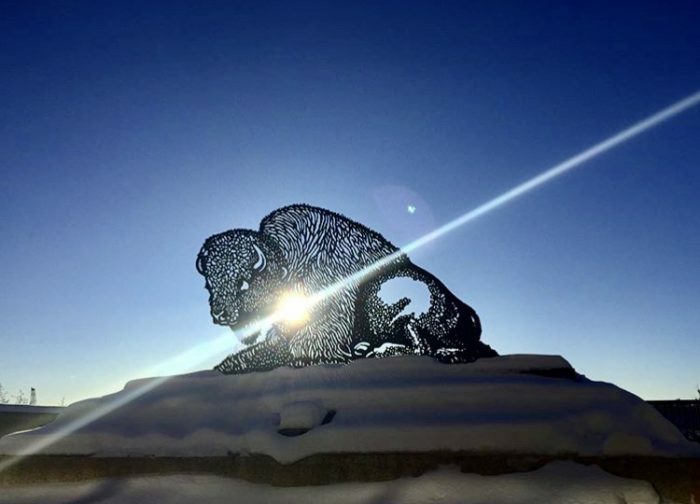 You can find this astounding sculpture located on our south end, overlooking the Valley on Treaty 6 land. Fact 32: From 1983-1992, we housed the Aviation Hall of Fame and during this time, a 1918 Curtiss JN-4 Canuck biplane was suspended in our main foyer. 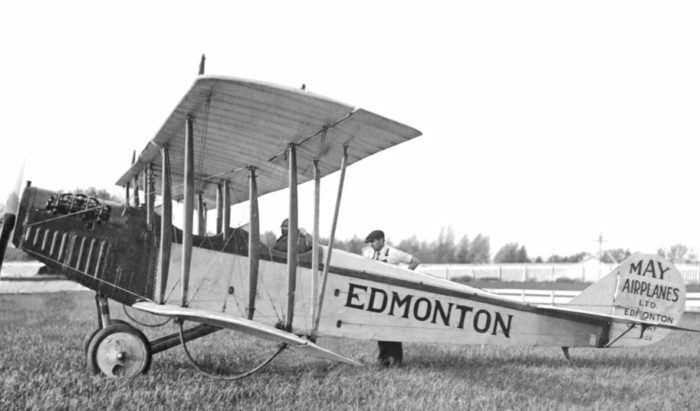 This aircraft made history in 1919 when George Gorman used it for Alberta’s first airborne commercial delivery of the Edmonton Journal! Fact 33: Our atrium is covered by 16 tonnes (32,000 lbs) of glass! 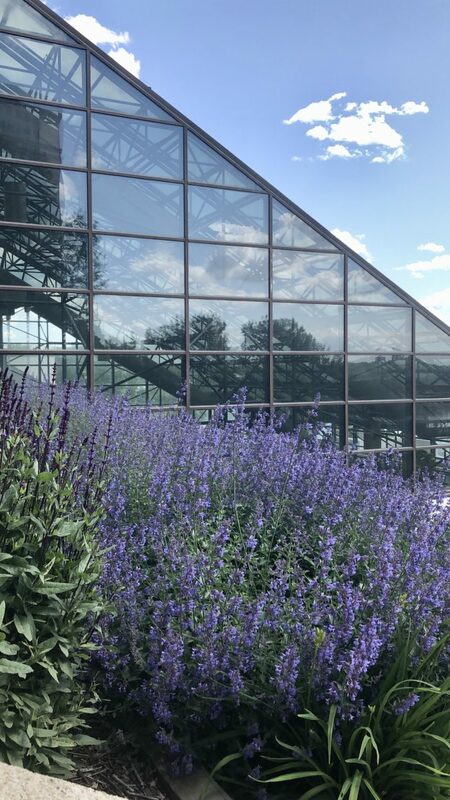 The vertical glazing is clear to provide maximum visibility of the River Valley and landscaped terraces, giving our building a sparkle across the river bank! 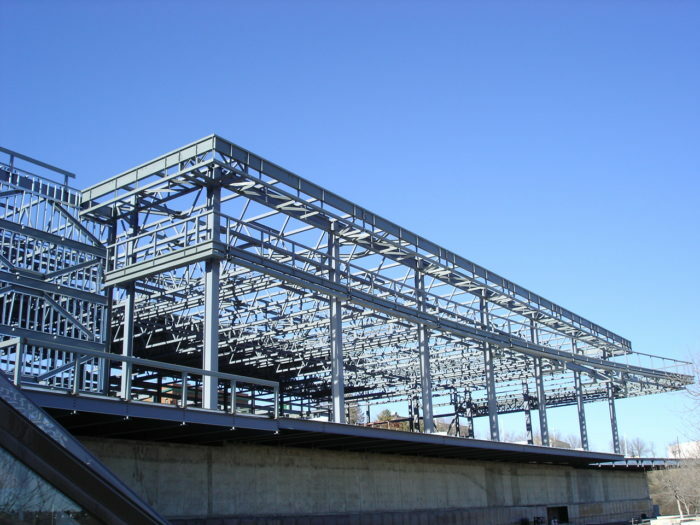 Fact 34: We were uniquely constructed as first known project in Alberta to use permanent tie-back anchors to stabilize the area adjacent to a building. 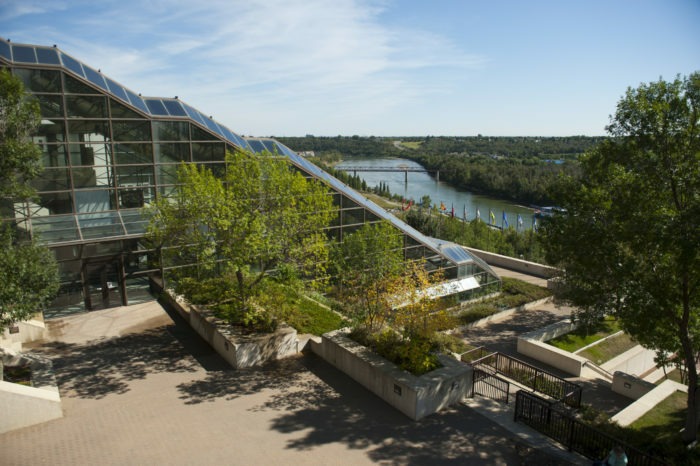 They extend 225 feet into the Earth preventing the building from sliding into the North Saskatchewan River! 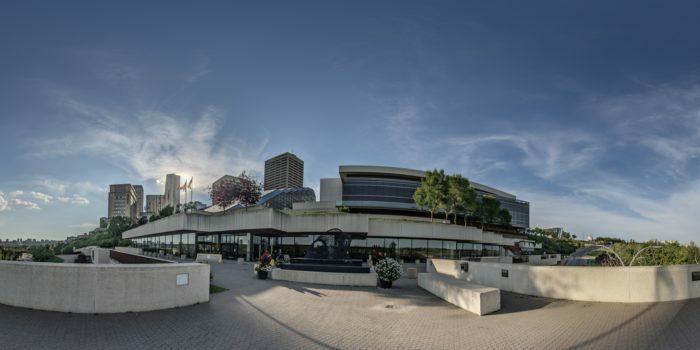 Fact 35: The Edmonton Convention Centre is home to so many who have grown with the building over the years! 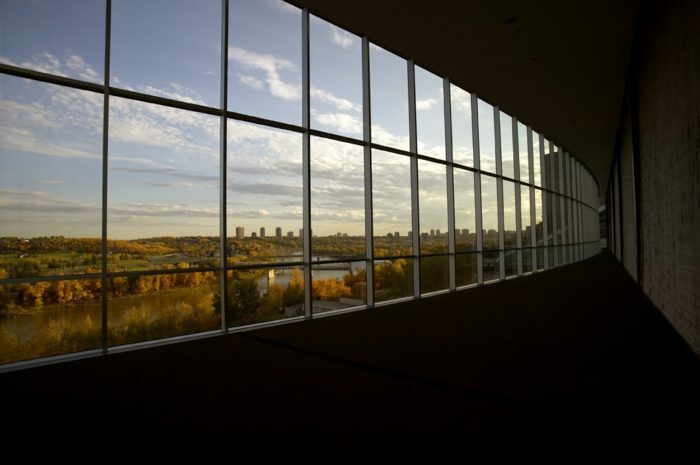 From our employees, to clients, foodies, music lovers and many more, the Edmonton Convention Centre is a piece of Edmonton’s fabric which has interwoven passions and people from all walks of life! For 35 years, Edmonton has supported us as an integral part of the community and we’re proud to share this milestone with you Edmonton. THANK YOU for a remarkable 35 years!